A site-specific performance by Nova Melancholia. Wirlwind. Walter Benjamin is thinking aloud. Everything is a matter of montage. The Pope is dead. Long live the Pope. History's automaton spits phrases. How can political and religious issues of History awaken the present? Through the hybrid text-collage Habemus Papam, Walter nine performers attempt to speak about lost paradise. 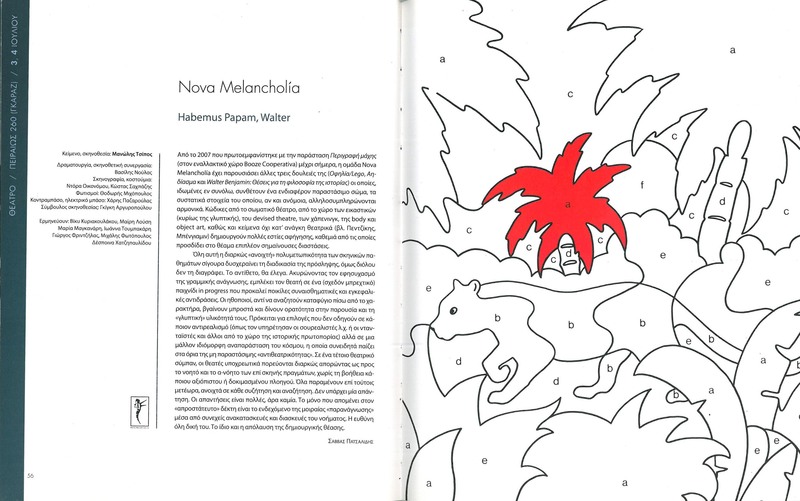 Manolis Tsipos' text Habemus Papam, Walter is published by NEFELI publication. "Habemus Papam, Walter at Peiraios 260. Interview with Nova Melancholia"